Caption: Osteoclast cells (red) carve a path through a knee joint (purple and white), enabling a blood vessel to supply the cells (yellow) needed to build new bone. Bones are one of our body’s never-ending remodeling projects. Specialized cells, called osteoclasts, are constantly attaching to old bone and breaking it down, using acids to dissolve the calcium. In the wake of this demolition, bone-building cells, called osteoblasts, move in and deposit new minerals to patch and remodel the bone, maintaining its strength and durability. Normally, these two types of cells strike a delicate balance between bone destruction and formation. But if this balance goes awry, it can lead to trouble. With osteoporosis, for example, bone removal exceeds formation, yielding progressively weaker bones that are prone to fracture. Paul Odgren, a cell biologist at the University of Massachusetts Medical School in Worcester, is exploring whether disrupting osteoclasts may open the door to new ways of curbing the bone loss that occurs in in osteoporosis, rheumatoid arthritis, and periodontal disease. 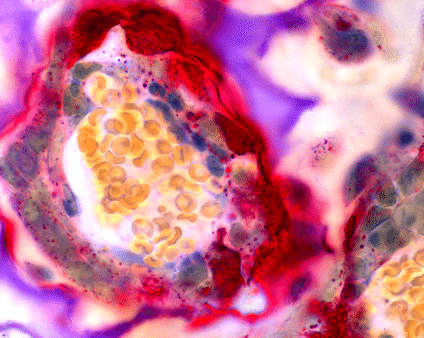 While pursuing this strategy, Odgren created this gorgeous image, which recently was named one of the winners of the Federation of American Societies for Experimental Biology’s 2014 BioArt competition. In this snapshot of bone formation, you can see osteoclasts (red) carving a path through the cartilaginous knee joint of a mouse (purple and white). Inside the tube carved by the osteoclasts, a new blood vessel carries blood cells (yellow) and other cells vital to bone building: bone marrow stem cells and osteoblasts.